I am a lifelong musician. I teach acoustic guitar and piano lessons in my Sellersville studio and local student's homes. I am also a Painter. I have two rather distinct bodies of work. One is in the impressionist style. As a Bucks County Artist, I am inspired by the New Hope School of the Pennsylvania Impressionists, especially their use of color and lively, expressive brushstrokes. I am equally inspired by the Abstract Expressionists and their technique of action painting with the subject matter coming from within. As a Painter, I do not believe in limits or in limiting myself or my work. I paint what moves me, what reaches out to grab me or reaches out from within to be seen. Some paintings arise completely from within, a figment of my imagination, an illustration of a thought or emotion, an instinct allowed to surface. I am not one to avidly follow "rules" regarding technique, purity of medium, etc. I think when it comes to art and painting; rules were made to be broken. I use whatever tools I have available to me to further my expression. I look to capture a moment, a gesture, a fleeting sense of a place in time. The art of photography is often combined with the art of painting, to compose, to capture and then depart. I wish to imagine, invent, and create an image that depicts more than a scene or person, but expresses a part of me, and hopefully engages each viewer to relate and share in that experience as well. For me, it is the journey and the joy in creating a work of art that truly inspires. Pamela’s art education, though primarily from self-study, also includes studies in drawing and portraiture at Millersville University, painting at Arcadia University, art history at Old Dominion University and watercolor at Abington and Doylestown Art Centers. Pamela has completed 21 fine art credits in drawing, design, photography, digital art and painting at Bucks County Community College. Pamela graduated from Arcadia University with a Master’s degree in Counseling Psychology. 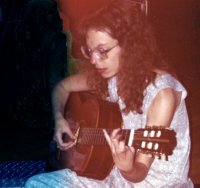 Pamela works in her home studio in Sellersville, Bucks County, PA. Pamela also is a Musician and Music Educator, and teaches lessons in guitar and piano.